Ask fellow campers about "Royal Oaks RV Park" and nearby attractions. 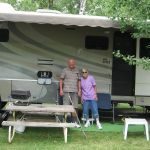 Question: Regarding Royal Oaks RV Park in Bemidji, MN, how was the WIFI at the sites? Answer: The WiFi worked good at Royal Oaks. The only campground we had bad WiFi in was Lewis and Clark state park. The WiFi there was terrible. The park was quiet and the people were friendly. Our site was number 11. Hwy 2 is close to the campground and our site was as far away from Hwy 2 as you can get. Being closer to the Hwy might have made some difference in road noise. Would stay here again. We camped at Royal Oaks RV Park in a Truck Camper. Terrific owner, helpful and informative. Gave us directions right to her place. She left us a note and map showing us where our spot was located. This place has a campground feeling with lots of trees, shade, campfires and space between. Some highway noise from the state road but not annoying. Bathrooms were clean and roomy. Hookups were a bit strange. The sewer was way at the back and the electric and water were closer to the front. I had to really look around for the water spigot as it was way at the top of the post. Not used to that. WiFi worked great. Good overnight stay for us. We camped at Royal Oaks RV Park in a Motorhome. You might need extra sewer hose. Second time here for an overnight stay. Very friendly staff, small campground with some seasonals. Don't hear traffic despite being so close to highway 2. We camped at Royal Oaks RV Park in a Travel Trailer. Very busy park; lots of well-kept seasonal sites as well as travelers. Well maintained and quiet. Only slight ding is so real noise due to proximity to major highway. Free wi-fi was hit or miss. We thoroughly enjoyed our several day stay at this park and would definitely camp here again if we were in the area. We camped at Royal Oaks RV Park in a Fifth Wheel. Great location to camp at while exploring the Bemidji area. Owner was very friendly and helpful. Located just off the highway, so there was some traffic noise from our campsite but perhaps not in others farther back. Clean, well kept campground. Big rig friendly with full hookups, gravel pads and trimmed trees! We stayed during 4th of July and the owners put on a very good fireworks display and also hosted a karaoke night around the community campfire. Laundry and clean showers and some groceries available too. We had no problem with WiFi service at our campsite #28 which was near the main entrance and office. We camped at Royal Oaks RV Park in a Motorhome. 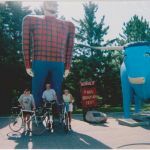 So much to explore in this area from biking the Paul Bunyan State Trail, hiking the two state parks nearby or fishing, boating, kayaking, or swimming the lakes nearby. And of course stop in to see Paul and Babe. A really nice upscale restaurant with a view of the lake was at Sparkling Waters. Also a great ice cream shop just across from the Paul Bunyan park. Located at the intersection of two busy highways, but surprisingly the road noise at night was not a problem even with our site #31 which is close to one of the highways. Campground covered with trees, so satellite reception was non-existent for us (even through trees were still bare of leaves). Interior roads and camp sites are packed dirt that probably causes a real dust problem in the summer. Which is why a 5mph speed is enforced (with a radar gun so says the sign at the entrance). Sites seem to be fairly level, although somewhat close together and the interior roads are easy to navigate. Laundry room is small with only two tired (and a bit rusty) washers and two dryers. Terri (the owner) is a cheerful sort who works hard to keep the park neat and clean. It might be on the crowded side during the height of the tourist season, but we'd definitely stay here again. We camped at Royal Oaks RV Park in a Fifth Wheel. This park is a good place on which to base your exploration of the Bemidji area. Large grocery store and bank is only 2-3 miles toward town, as is the tourist information center. Crowded when we visited, with some long term summer residents. The front loop is prettier than the back loop, but we stayed in the back loop and got good satellite reception. Wifi non existent unless at the office. Office manager and owner was helpful and friendly. We camped at Royal Oaks RV Park in a Motorhome. This campground is right off the highway and very convenient for an overnight stay. Clean shaded sites and clean bathrooms and showers with hooks and a bench, a door that latches and shower curtain to separate the shower from dressing area. Nice folks, would stay again. We camped at Royal Oaks RV Park in a Motorhome. Friendly helpful staff. Mostly wooded campground near highway but not a lot of traffic noise due to the heavily wooded area between the road and campground. Pleasant place to stay if you are exploring the area. Cable channels galore once you hook up the cable box provided for a fee. Wifi only available at the office. Would stay here again. We camped at Royal Oaks RV Park in a Motorhome. The rate is for a 30 amp site and a Good Sam discount. The woman at check-in was very nice, but there were a number of people checking in at the same time so it took about 30 minutes. The campground grounds were well-kept and heavily wooded. We were not able to get a satellite signal through the trees, even with our portable dish. The electrical was strong. They do have cable, but you have to use a cable box and have easy access to the back of your TV with some hook-up, plus there is a charge for the use of the box, so we declined. They have WiFi that was good at times, but slowed down to a crawl as many folks were online. The sewer hookup was strange. It was elevated without any screws, so we had a hard time getting our sewer connection to stay in place. We did not use the restrooms, but did use the laundry. It could use some help. The equipment was old and rusty and it could use a good cleaning. Our biggest complaint was the traffic noise since it is on the corner of two very-busy highways. It was quieter at night, but still definitely there. Also, it is very, very well-lit at night. We prefer dark and quiet. We would use this campground again as an overnight, but definitely not a destination. We camped at Royal Oaks RV Park in a Motorhome. Several things to do in town. Shopping is Walmart. Friendly staff, very welcoming. Sites are easy to navigate and the park is kept clean. We camped at Royal Oaks RV Park in a Motorhome. Better than the state park which is hilly and lacks services at the sites. Nice quiet, clean park, wooded, mostly level sites. Clean restrooms and showers, very consistent and reasonably fast wifi. Pull-throughs are long and roomy, and plenty of room in back-ins as well. Mosquito control was evident, staff was very helpful and friendly. There is no cable TV but we were able to get 8-10 local channels over the air with our antenna. We will definitely stay here again. We camped at Royal Oaks RV Park in a Travel Trailer. My rate reflects a monthly rate. The majority of the sites have trees blocking the southern sky which precludes using a satellite dish in many cases, however a few sites do allow a signal to be received. The Park is close to the highway but vehicle noise was not much of an issue . Many of campers who had pets allowed their dogs to run at large and we observed most of them did not clean up after them. The sites are packed sand with many on a slight slope so are not level, electric was OK as were sewer hookups. I have water filters and had to change them frequently because they filled up with rusty looking material. Check in was quick and service by the owner was excellent as was the park wi-fi during the period of time we were there. There was adequate spacing for most of the sites and park is well maintained and even serious mosquito control is utilized by the owner. There are several long pull-throughs and swing room to access and leave a site was generally adequate. We would stay again. We camped at Royal Oaks RV Park in a Motorhome. Stayed here for 2 nites prior to starting a caravan. Location is easy to get into. I had a pull thru spot. Sort of level, but I could not get the coach to level via my air bags. It took all of my 25' water hose to connect, most of my 35' elect to connect and 25' of sewer hose to connect. Others did not have that distance, but space #4 did. There are a few full timers, but their spaces were clean and not cluttered. My pull thru spot would allow the vehicle to remain hooked up. Next year they will require a deposit for a cable box for TV. For me, too many trees for my Sat on the roof. I would stay here again. We camped at Royal Oaks RV Park in a Motorhome. Super Walmart about 5 miles away. lots of shopping and restaurants in the area. Lots of fishing in the area. Lake Itasca State Park and the Mississippi headwaters are close by. a good place to use as a base to see Itasca State Park, woolen mill downtown Bemiji, and other local attractions. A nice place for breakfast in town was the Minnesota Nice Café. Right next door to the woolen mill. Ask for 30 amp specifically - no need for 50 amp with the temperatures in Bemidji. See the headwaters of the Mississippi River at nearby Itaska State Park. Are you affiliated with Royal Oaks RV Park ?